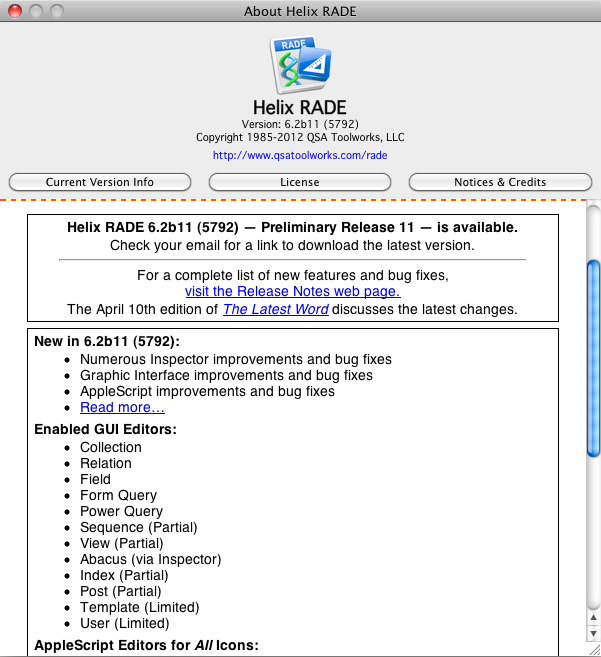 10 April 2012 — The good progress continues with the eleventh Preliminary Release of Helix RADE 6.2 for macOS available today. For those out there who haven’t joined us yet, remember that if you’re thinking of joining the monthly plan this month, the initial payment is now $220.00, which you will notice, if you have been paying attention to the subtle changes in this apparently boilerplate text-block from month-to-month, is now more than the cost of the full-year discounted price. The decision is, of course, yours. If you decide to hop on board right now, you can just pay the $220 and get the May update free. But if the spirit of love and goodwill fills your heart to the point where you elect to go on the monthly plan because you know how much we need that one more payment, it will cost you another $20 and, as we said a month ago, we promise not to think you’re crazy for doing so! One more note regarding updates: remember that your participation in the Europa Pioneer program entitles you to Interim Builds. What are these things and why should you care? Think of it like this: all month we work and work and work to get something just right by the 10th of the month and into your hands. But we keep working after that and sometimes make dramatic improvements as we go along. You don’t have to wait an entire month to see these things. And anyone who has downloaded those interim updates since March 10th has already seen some of the dramatic improvements we officially unveil today. 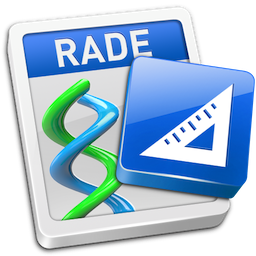 As our engineers make progress, we build new versions of RADE in order to test the new code. It is not necessarily ready for prime time, but it is another step forward. If you have any interest in using these builds, contact Matt because he has a sensational little script that makes the process of downloading and installing the interim builds completely transparent. As always, the complete notes regarding what’s new in this release are found in the Preliminary Release 11 Release Notes. For now, let’s turn our attention to this month’s bounty. Preliminary Release 10, released one short month ago, offered a glimpse into the macOS graphic user interface of RADE. We are very happy to report today what an understatement that was. Not only does Preliminary Release 11 fulfill that promise but in several cases, we have exceeded it, as you will see. There are so many new GUI components in place now that it’s hard to decide where to begin. To help us keep track of it all, we have a page that illustrates our progress, which we will update as we cruise toward the completion of the macOS RADE project. If you follow the link to that chart, you will see the current status of every Helix icon’s properties and elements color-coded, broken down into five “states of access” from pink (i.e., not available in any form yet) to blue (i.e., finished). As you can see from a quick glance at the current state of things, of 119 properties and elements shown, only two are still pink. And more than 80% of what you need to develop a Helix application is now available in the GUI. In the key at the top of the chart, there is also a sixth status color: green. This color is reserved to wrap around each icon when work on that icon is complete and all aspects of it can be manipulated both in AppleScript and with a click of your mouse in the GUI. A quick scan of that page will reveal that five of the twelve icons are now surrounded in that wonderful color. Of the remaining seven, there are only a handful of aspects that are still manageable only in AppleScript. Yes, those few remaining items are a big part of what makes those icons work, but with the rest completed, the path to the finish line is clear. What the chart does not show is how close those yellow items are to turning blue. Looking at the chart is one thing; seeing it all come to life in Preliminary Release 11 is quite another thing altogether. If you are already a Europa Pioneer, this might be a good point to stop reading, download Preliminary Release 11, open a copy of one of your favorite Helix collections and have a look around. While you’re poking around, here’s a selection of some cool things you can do to help familiarize yourself with the macOS Design Mode interface. 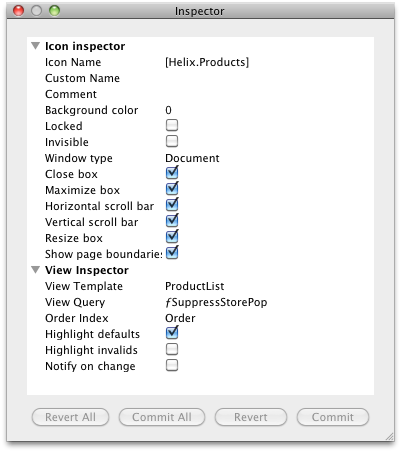 First, open any relation and open a View, then choose ‘Show Inspector’ from the ‘Icon’ menu (or press Command-I) to open the Inspector. In the Inspector window, click open the “Location Properties” disclosure triangle. Notice the left and top window properties along with the width and height. Now, click and hold down your mouse button on the View’s title bar and drag it around the screen. While you do that, watch the numbers in the first two of those properties. Wasn’t that fun? If the View’s Window type is Document, grab its resizing widget (the lower right corner) and resize the window. The width and height properties instantly update to show the change. Don’t like the new position and size? Click the Revert button and the old settings are restored. Like it? Click Commit or just close the window. And while you’re there, check out all of the other property settings now available for Views. The screen shots on the right show you the View Inspector from the March release, and what it looks like now. Settings that were found in the √ menu and the ‘Show Setup’ and ‘Show Posting’ modes (which are, by the way, a thing of the past) are here along with things like the complete set of Import/Export Properties that were buried in dialogs. Everything is here, in one central location. Want to explore some more? Go up to the Comments property and enter a long comment. When you Tab out (or click the Commit button) you only see the first line. Bleh. Now, move your cursor around slowly in the Inspector window and you should see the cursor change. When the cursor is between columns, it shows you that you can make the property name column wider. And when it is between rows, it shows that you can make the rows taller. Click and drag below the Comments field and you can now read your whole, long comment. You can also make the whole Inspector wider, just in case you’ve got lots of screen real estate. There are many places where little things have been done as well. For one, the ability to resize and reorder the columns in the Collection or Relation windows is back. Click between two headers and drag left and right, or drag a whole column to another location, letting go of your mouse when the vertical blue bar appears to indicate your insertion point. These are just a handful of hints that show some things that really illustrate the difference between Classic RADE and macOS RADE. There is much, much more to see. Experiment! Play! And use the Commit and Revert buttons. Get a feel for the way it works. Because the development process is always in a state of flux, it is often difficult to state precisely where things are in terms that are completely unambiguous. But as we near the end of the RADE project, there are three unmistakable elephants in the room: the Abacus, the Template and View by Icon. There’s also another creature lurking about, one we have discussed a few times already in The Latest Word. It is the fact that Helix Utility will not yet run in macOS 10.7, aka: Lion. As noted last month, when we began this work in earnest last June, we had settled on the idea of using the Inspector for as much as we possibly could, in place of the myriad dialogs that were used in the Classic RADE design mode code. A significant part of the complexity of this project was rooted in how to manage so many of those dialogs. The more closely we examined each function of Helix and where its commands resided, the more the Inspector appeared not only to be a good alternative, but actually a better way of doing many things in Helix. With that mindset as our foundation, the idea of having to write any dialog or custom editor was anathema. And once we began to see the progress that could be achieved using the Inspector, we decided to forge ahead and complete everything we could in that vein before turning our attention back to the elephants (and the lion). Now, we will admit that there are some situations where a dialog is the only reasonable way for us to provide a setting — such as specifying the selectable indexes for a View — but we’ve taken care to incorporate those into the Inspector, making that the hub from which most actions spring. The wxWidgets code lets us down a bit here, as it hides the fact that popups are popups and buttons are buttons until you click on them, but if you click on the Selectable indexes value in the Inspector, you’ll see a dialog that provides quick and easy index selection. But even with that caveat, the Inspector has proven itself capable of handling a great many tasks. The aforementioned ‘Show Setup’ and ‘Show Posting’ part of defining a view, which was always a bit quirky and sometimes problematic, fits into this new way of thinking quite nicely. Still, we have known since the beginning of this work that the Abacus and Template would each require their own editors, but the Inspector will help us here as well, cutting down on the number of editors and dialogs we will need. For instance, in Classic RADE, when you select a rectangle on a template, you could edit some of its properties using menu commands, some by double-clicking the rectangle to open a dialog and some both ways. In macOS, actions applying to a single rectangle or a group of rectangles will all be edited in the Inspector. Similarly, when you select a lookup tile inside an abacus, its content will be prescribed in the Inspector as well. Ultimately, all three projects are, as we see them, “big projects.” The lion may be fierce, but the two elephants can overwhelm him, which is just an irresistably literary way of saying that the Helix Utility project will take a month. but each of the others will take longer. And since it is vastly easier to get access to a machine running Leopard than one running Classic today, the urgency of the Helix Utility project diminishes a bit more. For these two reasons, primarily, we have opted for now, to put off dealing with our Lion problem until our two big elephants have been tamed. But there’s still a real possibility that we could tackle the Lion issue before we deal with the elephants. Whatever we decide will also depend on how and when we deal with that other elephant: View by Icon. What is the ‘View by Icon’ fuss all about? From the beginning of this project, one of the critical limitations has been that macOS RADE can only display collection or relation window content in what is essentially View by Kind mode from Classic RADE. If all your life, you worked in either View by Name or View by Kind mode, switching over to View by Icon probably left you confused, especially if you did so without selecting anything in the window beforehand. In that situation, switching to View by Icon would more often than not bring you to an empty window, prompting you to switch right back to View by Kind or View by Name and never going there again. The spreadsheet-like modality of View by Kind (or by Name) is all many Helix users have ever needed or wanted; it is the only way they have ever used Helix. But other Helix users felt hurt, even betrayed by the fact that macOS RADE lacks View by Icon mode, and have rarely allowed an achievement to pass without reminding us how much better things would be with the ability if only View by Icon were available. If you are one of those ‘list-type’ users, you are probably asking yourself why anyone would want to work that way. There are two principal reasons. The first is that Helix has always been distinguished from other products in its class by its visual nature. View by Icon, which allows you to manipulate icons in a Finder-like work space, reinforces that visual nature. The second lies in the old adage of a picture being worth a thousand words. For the visual thinker working in Helix, arranging related icons together facilitates working with them, and even opens up ways of working in Helix that are not quite as easy to achieve in list views. There are, for instance, programming situations that require a group of related objects to be duplicated, renamed and modified as many times as necessary to solve the problem. When doing this in Helix, regardless of the view, the duplicated icons all get the word “copy” appended to them. When renaming these icons in list views, it is too easy to remove the word “copy” and then be faced with two apparently identical icons and no clear idea of which one belongs in which group. Performing this operation in icon mode eliminates any doubt as to what belongs with what. A View by Icon evangelist could regale you with many more reasons why that view is better than a spreadsheet-style view. We take no sides in this debate; there are clearly advantages to both approaches and plenty of View by Icon die-hards will admit to the occasional shift to a listing view. But where does this all leave us right now? Well… we have learned a great deal in this first year of Europa, and some of what we learned taught us that getting back View by Icon is neither as big a job as we had feared it to be, nor something that absolutely had to wait until everything else was done. When we started the Europa program, one of our hopes was that it would provide enough steady income that we could work without interruption for the next year. That did not, in and of itself, turn out to be the solution we had hoped for. But thanks to a Helix user who paid us to implement the unlimited structure handling feature, we were able to keep work going long enough to get through the first year. And before we get too far afield of that wonderful diversion from our stated path and forget to mention this, the long-promised complete technote on applying structure is now available. We may still be running on fumes, but they are just a little better distributed over time, and the results do speak for themselves: we have made a great deal of progress in the first year of Europa given the resources at our disposal. Anyone who hung back for fear that this might go on indefinitely should clearly be able to see the end in sight now, as we do, and realize that they will live to see RADE for macOS after all. That having been said, we’re not through yet and the economic facts of our situation have not changed dramatically enough to make our intended path to completion involate. So if you are serious enough about View by Icon to participate materially in its resurrection, contact Gil directly for how to make it happen. If enough interested parties are willing to contribute, the task will get done sooner than later. The planned May 10th appearance of Helix RADE Preliminary Release 12 will mark the end of the first year of the Europa Pioneer program. We hope to make the same degree of progress between now and then as we did between March 10th and today. Beyond that, the future of Helix RADE for macOS is beginning to crystallize. As the second year of Europa begins, if no significant response to the call for View by Icon occurs quickly enough, we might be inclined to take a break and finish the Helix Utility project in June, if only because we know it will fit into a month more comfortably than either of the other projects. The next steps would then be the Template and the Abacus, in that order. One reason for this decision is that the typical Helix user in 2012 has a greater need to modify their templates than their abaci, so this decision is undertaken partially out of respect for that need. Another reason is that Preliminary Release 11 has the ability to edit an abacus in the Inspector, using the Abacus Expression Language (AEL) we developed for AppleScript. This means that with a little study, you can create and modify abaci right now, without having to learn AppleScript. No, the traditional graphic tiles and arrows you know and love aren’t there, but it is possible. And since there is no way to edit a Template right now, the need for that capability becomes more critical with each passing day. So our next major focus should be the Template. Both projects have the same degree of complexity. Both projects are critical enough that once we get into them, we will not want to be diverted until they are complete. If View by Icon becomes funded during work on the Template, it could come before the Abacus, but once started, we will not stop work on any remaining project until it is complete. And as noted last month, Client/Server and Helix Engine 6.2 are both on the way. We keep building them right along with our RADE advances, but we have still been too preoccupied with RADE to devote enough attention to start testing programs for them. Stay tuned on these items. Finally, we continue to need your active support. As noted above, we are still devising our plan for the rest of the journey. Watch this space soon for details.